If you have not heard this audio-clip of the teachings of Benny Hinn, please pay attention. The spirit within Benny Hinn is not from God of the Bible. This spirit is killing the saints. Do not let Hinn touch you. The audio-clip with this message is attached below. This is a transcript with the words of Benny Hinn. “The Angels can not preach the Gospel. No Angel is permitted, no Angel is qualified. No Angel can, because they do not even know what to say”. This is what Benny Hinn taught on God.tv, recorded from the web-site of the TV-channel on 19.09.10. This must be one of the super revelations Paul spoke about, by so-called “Super Apostles”. The problem is that the “gospel according to Benny” completely contradicts the Bible. There are 291 examples in the Bible where Angels are mentioned. They were sent by Father God. They came on a holy mission, and most of them had permission to speak and brought messages from Heaven. It was an Angels that came to the Jewish virgin and brought good news to her. In the “Gospel according to Benny”, non of these Angels were qualified. 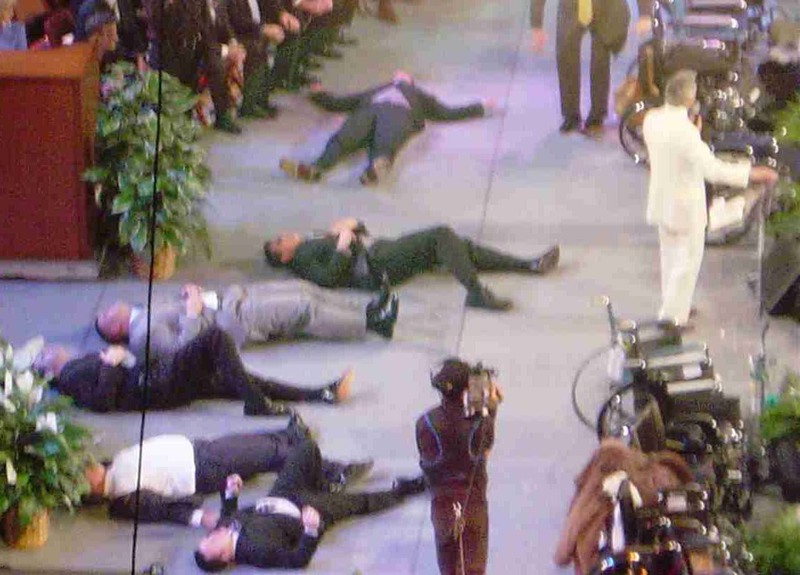 Here Benny Hinn again becomes a servant of Lucifer. Because if he could, Lucifer would not have permitted the Angels of the Bible to do anything. Lucifer has his own dark angles, that preaches a “different Gospel”, and tries to fool us to follow a “different Jesus”. Paul the Jewish Apostle warned us in advance, about this kind of “Jesus” that Benny Hinn seems to be following. What do you mean with “Angle”? Or are you talking about Angels? Thanks for correcting me in love. Benny Hinn speaks about Angels. You are right to ask this question. In what you quoted from Rev. 14:6, Have you ever noticed that Jacob fought with an angel of the Lord back in the book of Genesis? And that angel of the Lord was the Lord Himself? And the angel of the Lord is who Isaiah calls the angel of God’s presence in Isa.63? So you should ask yourself, was John talking about was refering to “angels” or “angel” in the context of Isa. 63 and Joshua 5:14 and 15. Ivar’s comment; Here Benny Hinn again becomes a servant of Lucifer. Yes I believe that is exactly what Benny Hinn is.
! !The angels need permision from Benny Hinn to preach the gospel!! Ofcourse any true believer in the Bible will know that these are not the Angels of God in Heaven, but ‘extraterrestrials’ in other words demons from outer space. They are also intelligent beings with the power of darkness to manipulate and destroy and they are ready to do any harm to mankind with just a ‘beck and call’ and that is exactly what Benny Hinn and all other false prophets are doing… But its not gonna last long … things are gonna happen so fast that these false prophets will not have the time to pull their pants up but will perish into the lake of fire where they will be roasted and toasted for eternity… Leave your evil ways while you still have a little time left and repent unto the God of Heaven and earth before He arrives. Shalom, and welcome with his comment. There are a lot of false Messiah’s preached in our day. Let me remind you about three of them who all deny the cross. This Jesus never saved anyone when He walked on the Earth. He only prepared the way for a greater god, presented to us by Hinn, a spirit he claims is The Holy Spirit. 2. The Jesus of the Koran. This Jesus never saved anyone when he walked on the Earth. He only preached about a greater prophet that would come, Muhammad. This Jesus never saved anyone when he walked on the Earth. He only preached about a greater salvation that would be made available in the after life, when we shall get or sins forgiven in purgatory. This copies of “Jesus” have one thing in common. They all will join the great compromise that is in the pipeline. And the false spirits they have placed in their followers, will convince them to join this common ground, for the sake of “World peace”. Am not a fan or follower of any man, Benny the least. But it is true that angels are not qualified to preach the Gospel. And the reason is simple. Because they have not experienced the saving grace. They have not experienced salvation. They may have given messages from God to different people in different times, but they cannot preach the Gospel. How can anyone who doesnt know what salvation is preach it??? It does not matter, what human made doctrines might claim. I believe in the Word of God. Let Benny Hinn and others proclaim what ever blasphemy they desire. Was that an angel or Jesus? I think it could have been either. But the bible depicts angels either appearing visually to an awake person or in a dream. So if it was just a voice, then test that “spirit” and ask it to reveal it’s name. I know this was long ago, but take it as a learning experince and test the next spirit. Since you were calling on Jesus at the time, I will say I believe it was him who spoke and was a way of gently letting you know he is real regardless of the sound of the prophetic words spoken to you about that day. We are close in age. I have not heard from an angel either. Does not mean they do not go about and carry the Gosple as in the biblical examples that Ivar listed above in other responses. If Benny Hinn is not preaching the word of God, to whom are you preaching not to hear what Benny preaches? He was referring to Men(christians) and not angels. also in Luke 4:18-19..preaching of the acceptable year of the Lord was and is to be done by man and not angels. Please read the biblical examples that Ivar listed above in other responses. And the scripture you quote simply tells men to do it. It does not command angels not to do it. Dont assume one from the other. Do not be misled! The scripture Ivar quoted are from Revelations. Revelations is the end times. There are many passages in the Bible, where our God has used and will use angels to deliver his Word. Then the angel said to the women in reply, “Do not be afraid! I know that you are seeking Jesus the crucified. Then I saw another angel flying high overhead, with everlasting good news to announce to those who dwell on earth, to every nation, tribe, tongue, and people. Great, to have you back on site. Blessings. I am glad to meet Gloria too. But I don’t understand, why you aren’t answaring Moses, Ivar Fjeld. Hello Friends of Israel, I believe Ivar did answer Moses when he used the Bible verse: Revelation 14:6 Then I saw another angel flying in midair, and he had the eternal gospel to proclaim to those who live on the earth—to every nation, tribe, language and people. Ivar Fjeld didn’t answer Moses, Gloria. And you know it very well. Are you co-editor now, Gloria? We need to know that. “Liz” on clamed to be “Friends of Israel”. Whoever is behind your internet ID, this was your last comment on News That Matters. Please find your self another website. Gloria, welcome back. Surely Gloria is my co-editor. In our day, Angel will not bring message anymore, because it’s Holy Spirit Generation. Benny Hinn is not that wrong, he was right. Jesus or the Father nor Angel will not come to us and preach the Gospel, because God gave us his word (Bible) and The Holy Spirit who will help us understand the bible. “God, who at various times and in various ways spoke in time past to the fathers by the prophets, has in these last days spoken to us by His Son, whom He has appointed heir of all things, through whom also He made the worlds” (Hebrews 1:1-2). “For if the word spoken through angels proved steadfast, and every transgression and disobedience received a just reward, how shall we escape if we neglect so great a salvation, which at the first began to be spoken by the Lord, and was confirmed to us by those who heard Him” (Hebrews 2:2-3). The word for “preach” comes from the Greek work kerusso which literally means a herald or a town crier. This job has always been given to men. Even under the Old Testament, angels might deliver a message to a man, but that man was then expected to spread the word. This is what was being referred to in Hebrews 2:2. A case in point is the conversion of Cornelius in Acts 10. Cornelius was visited by an angel, but the angel himself did not tell Cornelius the gospel message. Instead, Cornelius was instructed to send for Peter. “About the ninth hour of the day he saw clearly in a vision an angel of God coming in and saying to him, “Cornelius!” And when he observed him, he was afraid, and said, “What is it, lord?” So he said to him, “Your prayers and your alms have come up for a memorial before God. Now send men to Joppa, and send for Simon whose surname is Peter. He is lodging with Simon, a tanner, whose house is by the sea. He will tell you what you must do.”” (Acts 10:3-6). The nearest we come to an angel preaching in general is found in Revelation 14:6-7, “Then I saw another angel flying in the midst of heaven, having the everlasting gospel to preach to those who dwell on the earth–to every nation, tribe, tongue, and people– saying with a loud voice, “Fear God and give glory to Him, for the hour of His judgment has come; and worship Him who made heaven and earth, the sea and springs of water.”” Here though, we have symbolism that must be understood. The word “angel” literally means messenger. In Revelation 2 and 3 are letters written to the various angels at different churches. Many feel that the letters were addressed to the preachers at those churches, the ones charged with the delivery of the message. Others feel the angel is the overall spirit of the church, and the letters are more directed to the congregations as a unit. Here in Revelation 14 we must consider whether we are talking about a literal angel, or an angel representing the preaching of the gospel by Christians working behind the scenes on the spiritual plain as men worked on the physical plain, or a symbol of the spirit of the gospel being preached shown in the form of an angel. In other words, because of the nature of Revelation, we cannot jump to the hard conclusion that angels directly taught the message of God. Paul once, making the strong point that the gospel message is not to be changed, said, “But even if we, or an angel from heaven, preach any other gospel to you than what we have preached to you, let him be accursed” (Galatians 1:8). The point being is that even if someone claimed to have a new and different message from God, delivered by an angel, it doesn’t matter where it comes from. A different message, no matter how high the source, is a false message. God is consistent in what He teaches mankind. Then doesnt Revelation 14 answer in the affirmative to angels preaching the gospel? And i feel you have said since a man is to continue preaching the word he may have received from an angel, you assume the word given to the man was not at all preached by the angel in the first place. If preaching is crying out a message then anything and anyone who has a voice could do this. An angel can cryout that Jesus is Lord. And when you go into what “might” be about literal and figurative angles, it just gets off topic. God’s Word is literal with exception to the obvious: simalies, metaphors, and poetic language. An angel is an angel in scripture. There are no figurative angels in scripture. The problem we have here is that the writer of this article has been unable to distinguish between the gospel of our Lord Jesus Christ and a Message from God. The gospel (good news) became only possible after the death and resurrection of The Lord Jesus Christ, so all the references you gave with Old Testament scriptures cannot therefore be the Gospel. The reference you gave with the Book of Revelation will only take place after the SAINTS (believers) have been taken out of this evil world. At this present time Angels cannot preach the gospel (good news). In Acts 10, God gave a message to Cornelius through an Angel so he could look for Peter who had been saved through the Gospel (good news), so Peter could preach the gospel to him. Angels don’t preach the GOSPEL,they are rather sent by God to serve those who are saved through the GOSPEL (Heb1:14).I hope this helps.